Featuring Amrit Palsingh, Eric Hayhurst, Hana Barkowitz, Tom Erdmann, Gina Erdmann, Dave Davies, Anthony Ray Hinton, John Dougherty, Calene Van Noy, Sierra Kos, Christina Ballantoni, Joe Concra, Denise Orzo, Vetress Boyce, Adrian Ojeda, Boots Wardinski and Vernon Kimball IV. Directed by Duane Andersen, Don Argott, Yung Chang, Garth Donovan, Petra Epperlein, Vikram Gandhi, Raul Gasteazoro, Jamie Gonçalves, Andrew Beck Grace, Alma Har’el, Sheena M. Joyce, Daniel Junge, Alison Klayman, Ciara Lacy, Martha Shane, Elaine McMillion Sheldon, Bassam Tariq and Michael Tucker. Distributed by The Orchard. 104 minutes. Not Rated. I walked into the theater with trepidation as other audience members and Festival volunteers gave voice and echoed what I felt – “It just feels too soon to relive this” – particularly as one year later, our nation is still reeling in the throes of upheaval and constant change. There was another part of me that felt curious about how a documentary would handle the coverage of the 2016 election’s surprising outcome, one that has become the hallmark (or a symbol) of our nation’s great political divide. My teenager joined me for the film with the same curiosity. 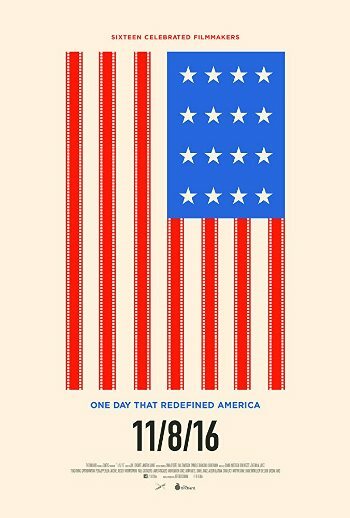 11/8/16, the 1 hour 45-minute documentary covering the 2016 United States Presidential election, is broken down into three parts – the morning, the afternoon, and the evening. Camera crews were embedded with Americans across the United States: Americans voting blue, Americans voting red, Americans voting for an Independent. The crews followed a man in Hawaii unable to vote after release from a felony conviction and a man in Alabama voting for the first time in 30 years after exoneration from death row. Crews followed and interviewed a Sikh taxi driver, a dreamer turned activist, a business owner, a coal miner, a PTSD-riddled military veteran. It covered 25 states and a wide range of voters – their hopes, fears, and discontent. The camera crews captured America in one of the most explosive elections of our time. 11/8/16 by no means answers any of our post-election questions, nor does it judge or critique the voters from any side. I suspect people will find flaws and division with this film and people will complain that that the individuals and families followed do not adequately represent their own personal hopes, fears and discontent. I suspect people will be shouting about bias in the characterization of the red and blue supporters. While the film certainly shows a diverse snapshot of America on this day, it by no means captures the red voters that I know. The blue voters chosen appear to be relatively well educated, young, idealistic, and hopeful for a future continuing in the footsteps of the outgoing administration. The red voters chosen seem to be blue collar, hardworking, and relatively less educated in comparison to the blue voters. This may be a symptom of the resulting election outcome – absent were the well-off, white men and women, and evangelicals who came out in numbers to support the Trump vote. More importantly, only briefly mentioned, were the completely silent majority who didn’t stand up to vote for anyone at all. The creators of this documentary, through their choices in casting, in a way mirrored the way many Americans, media and the world perceived the state of affairs in America which overlooked these important voters. No, 11/8/16 is not the critique or answers that many of us are looking for a year after this historic election. But truly, it is NOT too soon. The stories are representative as a jumping off dialogue between members of America’s “Melting Pot.” This film is a living history of this important day that serves as a reminder that we all have our own stories, our own experiences, our own hopes, fears and discontent. It is high time that we listened to and learned from one another. Copyright ©2017 PopEntertainment.com. All rights reserved. Posted: November 8, 2017. Tags: 11/8/16, Adrian Ojeda, Alison Klayman, Alma Har'el, Amrit Palsingh, Andrew Beck Grace, Anthony Ray Hinton, Bassam Tariq, Bonnie Paul, Boots Wardinski, Calene Van Noy, Christina Ballantoni, Ciara Lacy, Daniel Junge, Dave Davies, Denise Orzo, Don Argott, Donald Trump, Duane Andersen, Elaine McMillion Sheldon, Eric Hayhurst, Garth Donovan, Gina Erdmann, Hana Barkowitz, Hillary Clinton, Jamie Gonçalves, Jeff Deutchman, Joe Concra, John Dougherty, Martha Shane, Michael Tucker, movie review, Petra Epperlein, PFF26, philadelphia film festival, PopEntertainment.com, Presidential election, Raul Gasteazoro, Sheena M. Joyce, Sierra Kos, Tom Erdmann, Vernon Kimball IV, Vetress Boyce, Vikram Gandhi, Yung Chang. Bookmark the permalink.